This is, I'm afraid, one of those 'a friend of a friend of a friend' stories: nevertheless, I have checked it out thoroughly, and am certain that in most details it is a true account of an amazing occurrence. As must frequently be the case, some names and places have been changed to disguise the identity of our correspondent….. Someone well known to the Webmasters has a close relative who has, since childhood, displayed the curious ability known as automatic writing. This is a much-studied phenomenon, where the spirit of one who has 'passed through the veil' appears to have returned and taken control of a receptive person: at such times, the medium may write messages in the handwriting of the possessing spirit. The distant acquaintance of whom I write in fact only received messages from a dead parent, with whom they had been very close in life. The messages were mostly concerned with family matters, but sometimes described the afterlife and often bade the living to have no fear of the final journey. Some years ago, however, a different journey had been planned: by aeroplane to the U***ed States. A large group of the extended family had planned to holiday together, and were excitedly anticipating the trip of a lifetime: for many of them, this would be their first taste of air travel. It will not reach its destination. Do not fly tomorrow, I beg you! At this point the pen dropped from the white fingers of the writer, who abruptly sat upright in the usual state of dazed confusion. After a somewhat uncomfortable silence, the group began to try to make light of the unexpected occurrence. There was much discussion and nervous laughter: eventually it was time to retire, and the consensus was that the writer had subconsciously been expressing their own fears rather than those of a departed relative. The next morning, the family breakfasted in good heart and set off in a convoy of cars for H**throw Airport. ...only to crash in flames into the Atlantic Ocean some two hours later! But the best angler I ever knew? Well he appears elsewhere in these memoires: his name was Peter, and you may recall him figuring in a story about disappearing wall paintings. He had the most astounding 'watercraft' and caught specimen fish almost at will, using his beloved ancient centre-pin reels and split-cane rods. During World War 11, Peter flew fighter planes and never failed to enliven a slow day with some astonishing account of the air war over France and Germany. The events described in this story, however, took place around 1970, just before Peter and I first met as teachers at the same Norfolk Secondary Modern School. 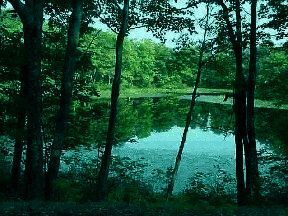 You should know that anglers, then as now, are always searching for some semi-mythical unfinished or neglected lake, where the fish are heavy, wild and totally unfamiliar with modern tackle or baits. Well one day Peter found just such a lake! It was a tree-girt pool of around an acre in the grounds of a somewhat run-down Norfolk Manor House. No swims had been cut in the bankside vegetation, and a derelict boathouse gave mute testimony to decades of neglect. "You will obtain your permit from my Gamekeeper in person on the 15th of June each year, and surrender it on the 1st of September. If you deviate from this in any way, your permission will be rescinded!" 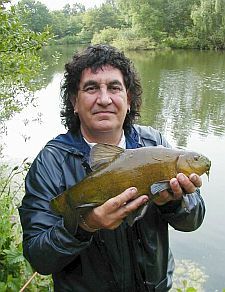 For several seasons, Peter followed these directions to the letter, and enjoyed the kind of exclusive sport of which we brothers of the angle can only dream: the average weight of the carp was in the region of twenty pounds, and what few Bream and Tench shared the lake with them were all of specimen size. But there was one huge fully-scaled Common Carp that resisted all of Peter's attempts at capture: being a veteran of the original Redmire Syndicate, our hero assessed it as nearer 50lb than 40! Whenever he met the Gamekeeper, Peter would mention the huge fish. "Never fear!" laughed the old Bailiff "You'll find the right bait for 'The Colonel' one day!" But the elderly retainer wasn't destined to witness the event, for when Peter arrived at the Keeper's Lodge to collect his permit at the start of what transpired to be his final season at the lake, he found that the old man had died during the preceding harsh winter. His elderly widow ushered Peter into her small sitting room and offered him tea, before handing my friend his permit and what appeared to be a wooden tea-caddy. "I'm afraid this will be your final permit, Mr Nisbett. The estate is up for sale, and I am going to live with my daughter. But my husband wanted you to have one last go at the Colonel. He left you some of his special bait to try...... There should be enough for five nights, then whatever happens, you must cease fishing." It was on the fifth and final night's fishing that Peter finally hooked the Colonel right beneath his rod-top! The box had proven to contain a coarse powder reminiscent of whole-meal flour which Peter had made into a paste with egg yolks, and it was a golf-ball sized lump of this that had finally proven irresistible! Already this wonder bait had accounted for over a dozen wonderful carp and now it seemed it was to account for the Colonel himself! But it was not to be..... After a titanic struggle of over thirty minutes, Peter was dismayed to feel the size 2 hook straighten and pull out of the fishes gnarled mouth! The very next day Peter presented himself, booted and suited, at the Keeper's Lodge. When the elderly widow answered his knock, Peter asked if it might be possible for one more sample of the wonderful bait and one more night's pursuit of the giant carp. "I'm afraid I can't help you dear," the old lady replied " You see, the 'bait' was my poor husband's ashes. It was his fondest wish to stay with his beloved carp somehow, and I couldn't think of any other way to make it happen. I hope you don't think I've taken a liberty!"